Cardiff | Where is Yvette? I came to Cardiff for two reasons: I wanted to dip at least a toe into Wales and because of the hostel. 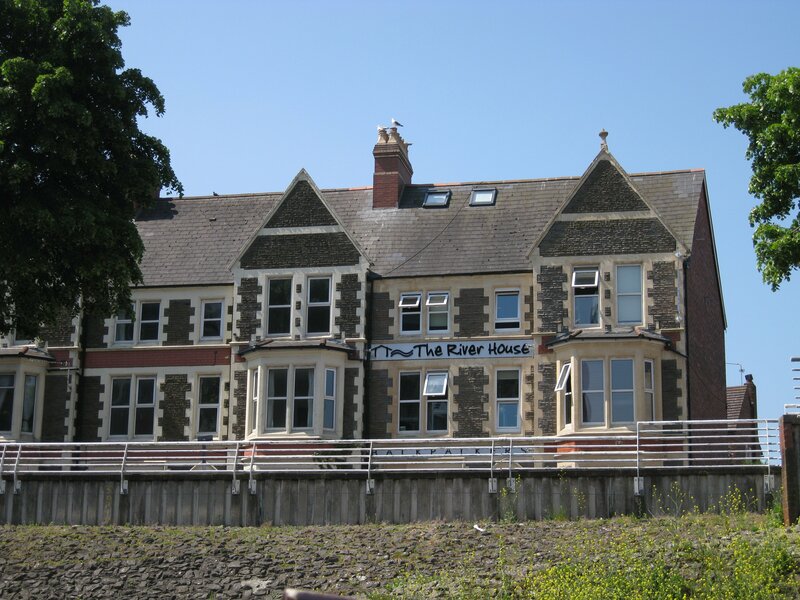 I’m sure the latter reason sounds like an odd one to visit anyplace, but for months now I’ve been primarily relying on Hostel World for my hosteling information, and while some have been good and some have been bad it has not escaped my notice how at 96% the River House Backpackers in Cardiff is often rated the best backpackers in the world. I soon became fascinated with this- what constitutes the world’s best hostel anyway? Wasn’t it worth a two night detour to find out? Anyway, this is the River House backpackers as seen from the water bus that runs up and down the river. To be honest it really is nice- excellent location and breakfast spread, above and beyond friendly staff, and a comfy lounge with big TV and the rest of the works. While I can see why they win on the ratings scale, I confess this hostel was a reminder of how what you remember most about places are the people you meet which is a factor you can do nothing about. For example, I was awakened at this hostel at 8am by a German girl blasting her hairdryer beside my bed who uttered an unconvincing “sorry” when I shot her the death stare known in the hosteling world as synonymous with “you are being a jackass, stop now,” and it’s not like you can do a thing about that! So it goes. Anyway, Cardiff. I like Cardiff. The weather was this clear blue sky that makes you convinced the Welsh really have great weather they make up stories about so they don’t have to share (cue the maniacal laughter from anyone who has lived in Wales ever), and there’s enough going on in the city that you can happily spend some time exploring. This here is a view of the enormous Cardiff castle that takes a few hours to explore properly. 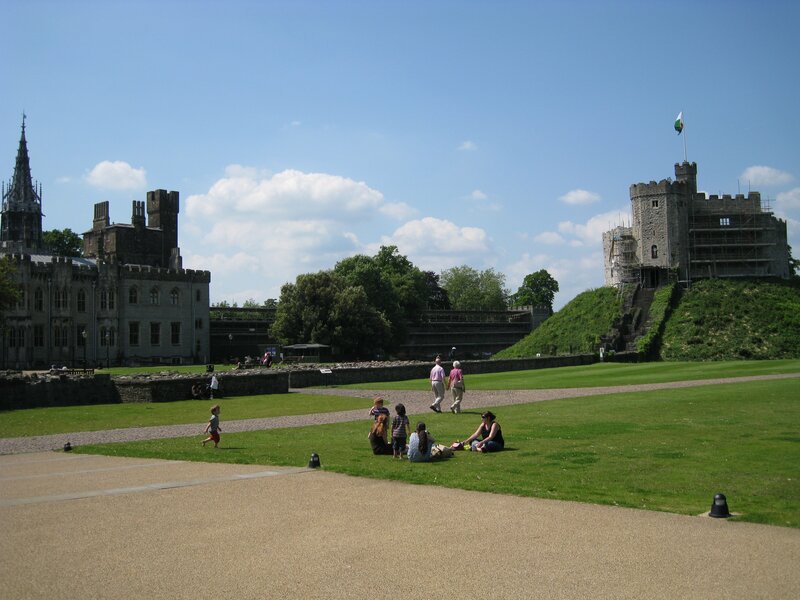 My favorite thing about it is it turns out residents of Cardiff can enter the castle for free so on days like this many do to picnic with their families, and after lunch the parents laze about while their kids are encouraged to run around with cheap plastic swords and other props. Wouldn’t be awesome to grow up where your playground is a castle?! 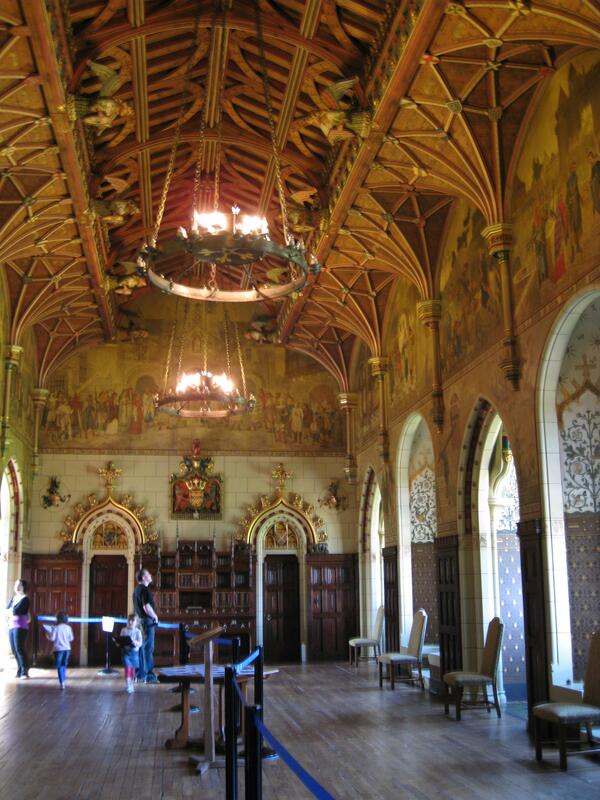 The interior of Cardiff Castle is pretty sweet as well- the nobles that had it in the past century redid everything in a lovely classical style, so the whole thing feels a bit like Ludwig II’s castle in Germany. 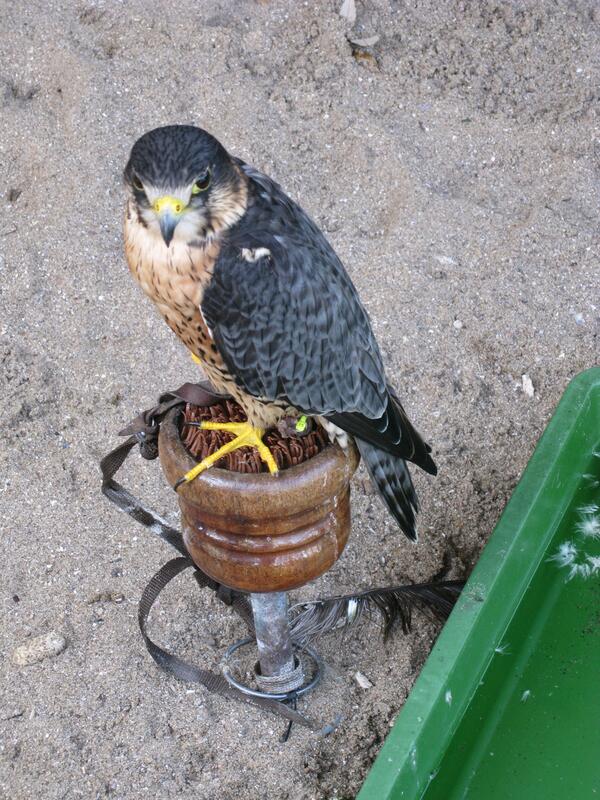 Oh, and there was a falconry too! They used to have peacocks at the castle up until two years ago as well, but they kept climbing up a wall and launching themselves into a busy intersection and wandering into Burger King. Needless to say this caused much unhappiness on both sides, so the peacocks were sent to a farm far out in the countryside where there are no fast food joints to disturb for miles. Perhaps I’m mean, but when I saw this museum I laughed out loud. 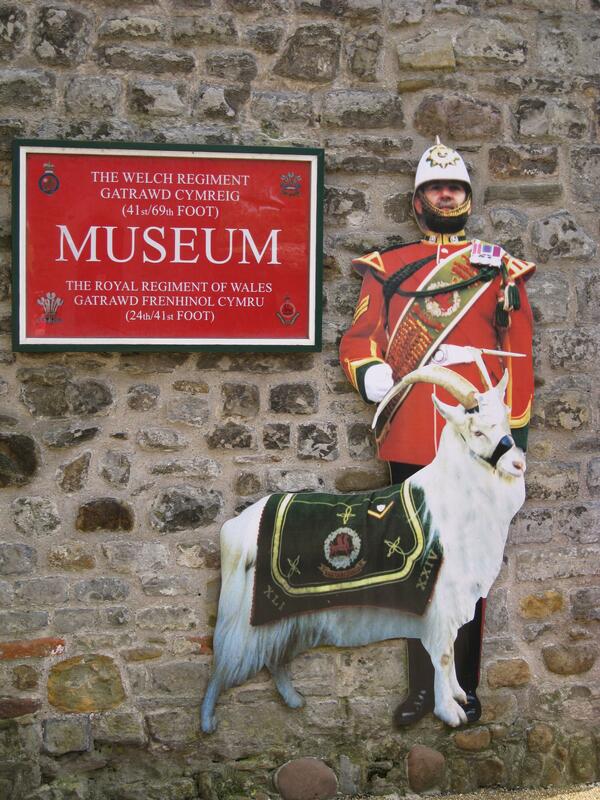 Perhaps the reason the Welsh could never defeat the English is they didn’t realize goats aren’t exactly the most frightening of creatures to have in your regiment? Speaking of Welsh, I was always on the lookout to see how many differences there were between Cardiff and England proper, even though I’m told this isn’t “real” Wales yet. Verdict? It’s much more like England than Scotland was, but the Welsh really have the Scots and even Irish beat when it comes to speaking their original language. Only 3% of Scots speak Gallic and you see it on roadsigns occasionally, Ireland you see Irish most everywhere and they learn it in high school but hardly anyone speaks it, but in Wales it’s written first and lots of people speak Welsh over English! 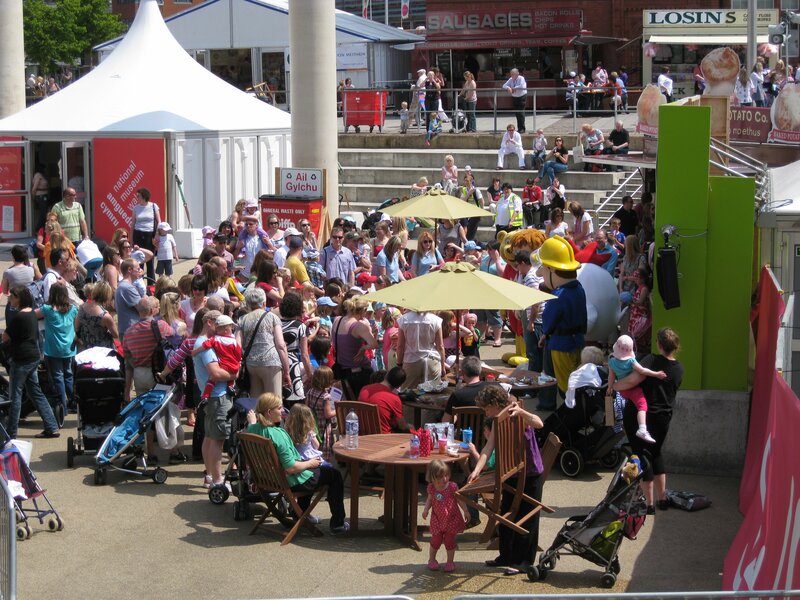 The above is from a festival by the harbor that was a language festival where I couldn’t understand a word- the kids above are singing along in Welsh to the costumed characters in front- and you saw several kids wandering around working on their Welsh school assignments. Speaking as someone who speaks an obscure language that has minimal use outside its borders, good for them. Glad to see they still use it. This entry was posted in RTW #1, United Kingdom. Bookmark the permalink.